One troy ounce bars are amongst the most widely consumed size of silver bars for a number of different reasons. Not only are they inexpensive relative to 1 ounce coins, but they also are easy to store and offer outstanding “divisibility” to investors who may wish to sell a portion of their holdings in the future. In the following few sections you will be informed as to how many different companies produce silver bars, how to store them, as well as how you can expect to receive them once they are shipped from an online dealer. Strictly speaking, a pure silver bar with the weight of one ounce is the same as just about any other 1 ounce pure silver bar, but like just about anything else the brand behind the bar often matters a great deal to people. Just like folks have brand loayalty to clothing and electronic companies, the same goes for people and what type of silver bars they purchase. 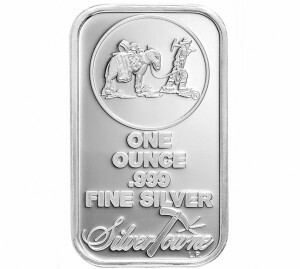 Most 1 ounce silver bars are about the same size and shape, however some special editions carry a different design and/or dimensions. These deviations from the typical size of a silver bar are few and far between, as nearly all bullion rectangles are the same exact shape. The standard size of a silver bar of one ounce is about 50mm x 30mm x 2.7mm. Most providers will be within a millimeter or so of those dimensions. As you can see they are smaller than you may have imagined, and to put it in perspective, you could easily fit a few bars inside your pants pockets. The first question that most prospective purchasers of 1 ounce silver bars have is as to how they are going to store all their silver. The answer to that concern is actually quite simple because 1 oz silver bars take up almost no space at all. Silver bars are packaged in sheets of 20 much like baseball cards inside a collector’s binder. These sheets can be easily folded and manipulated to fit just about anywhere; under your bed, in your closet, etc. It isn’t until you start purchasing massive quantities or larger bars that storing your precious metals actually becomes a big issue. 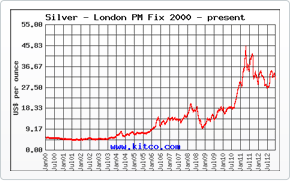 Due to the fact that 1 oz silver bars are amongst the smallest regularly fabricated bars, the associated premiums over spot tend to be high relative to larger bars. Typical new 1 oz silver bars that aren’t special logo bars or an extremely sought after brand tend to sell in the retail market for ~$2 over spot per ounce, with discounts available on quantity purchases.